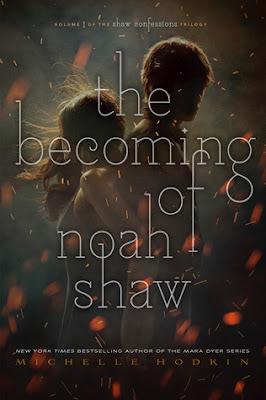 The Becoming of Noah Shaw is the first book in The Shaw Confessions series by Michelle Hodkin. This new series is a companion series to the Mara Dyer series, and picks up not long after where The Retribution of Mara Dyer ends. You could definitely read this novel without having read the original series first, as a good bit of things are explained throughout the story, but parts of it could be confusing, so if you haven’t read the original series yet, you may want to do that first. The storyline for the book feels new and fresh, while still having some familiar aspects from the previous books. I’m super curious to get my hands on the next book, especially considering that this book ends with a pretty huge cliffhanger. The story is narrated by Noah Shaw this time, whereas the previous series was narrated mostly by Mara Dyer. It was interesting to be in his head throughout the story, and to get his viewpoints on what was happening. Most of the characters that we know and love from the previous books are along for the ride in this new book, though in a way they feel almost mysteriously different in a way. (Maybe that’s just me? Who knows what happened to them between the time that the two books took place.) We’re also introduced to a few new characters in the story as well, and I’m definitely curious to know more about them as well! Overall; The Becoming of Noah Shaw was an interesting read, and I’m super curious to know what’s going to happen over the course of the series. And, after that pretty massive cliffhanger ending, I’ll be pining away to get my hands on the next book in the series, which does not currently have a title or a name. The wait will be excruciating! If you haven’t yet read the Mara Dyer series, do add them, and The Becoming of Noah Shaw, to your TBR today!